This extremely attractive painting is very close to similar arrangements by the Scottish colourist Samuel Peploe, and may be a direct copy of a Peploe. 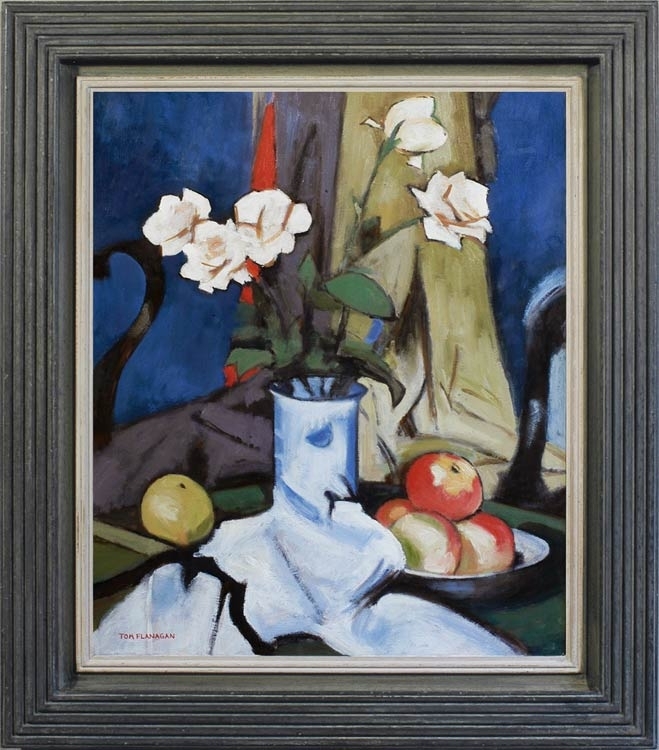 However, since no exact model has currently surfaced, it would be satisfying to think that Flanagan is here breaking his technique as faithful copyist, and is producing a distillation of various works by Peploe in which the vase, background curved chair, bowl of apples, drapery and creamy-pink roses all feature separately. Whatever his different sources may have been, Flanagan has produced a beautifully balanced and subtly-composed image, which functions on its own terms as a highly-desirable flowerpiece.